Vaslav Nijinski was the son of the Polish dancers Tomasz Nijinsky and Eleonora Bereda. He graduated from the Imperial Ballet School in St Petersburg in 1907 and joined the Ballets Russes in 1909, where he worked under its founder Sergej Diaghilev. In 1913 he married Romola de Pulsky, the daughter of the Hungarian actress Emília Márkus. This led to a conflict with Diaghilev, who may have been in love with him secretly. He resigned and attempted to start his own ballet company. During the First World War he was under house arrest in Hungary until 1916. He was freed after Diaghilev, Alfonso XIII of Spain and President Wilson all called for his release. He started touring but the stress of the management was too much for him and he became mentally unstable. In 1917 he settled in Switzerland with his family but his mentall ilness grew worse and he was never able to dance again. Romola stayed with him until his death in 1950. He was buried at St Marylebone Cemetery in Finchley, London. After three years his remains were transported to Paris and he was reburied at the Montmarte Cemetery. 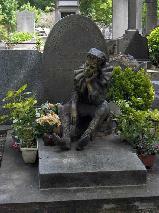 The grave of Vaslav Nijinski at Montmarte Cimetière, Paris.